We're entering into the holiday season here in America. We haven't even crossed the Thanksgiving threshold yet, but some stores are already tossing up tinsel. Radio stations have begun their months-long assault of festive music. Some of us are gradually increasing our alcohol intake in preparation of spending lots of time around our families in the coming months. And then, of course, there are the invisible aliens that are trying to kill us all. 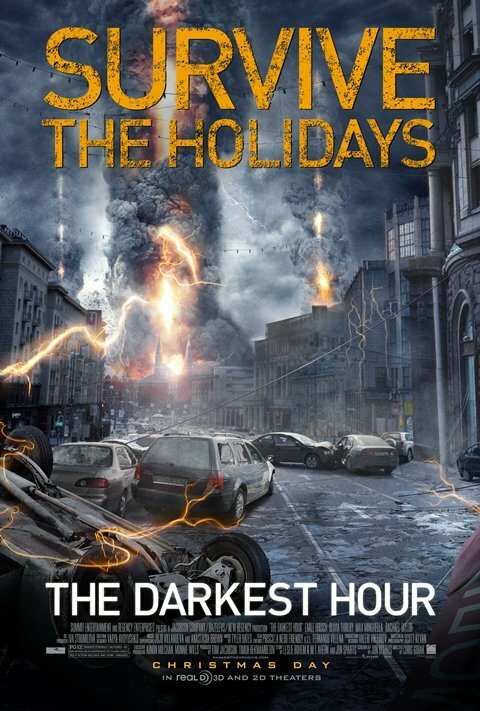 You wouldn't think the holiday season would be an ideal marketing theme for producer Timur Bekmambetov's (Wanted, Night Watch) upcoming alien-invasion flick The Darkest Hour, but the movie opens Christmas Day, so they've decided to embrace that fact in the latest poster. After all, nothing says "season's greetings" like an apocalyptic landscape punctuated by towering pillars of flame. You can check out the poster below, or click on it to see a ginormous version. The Darkest Hour's premise is the standard aliens-want-to-kill-us fare, but there are several elements that set it apart. First up, the aliens can't be seen, so the humans on the run have to keep an eye out for the weird electrical phenomena that occur around the critters, as you can see in this trailer. That should lend itself to some interesting set pieces at the very least. Second is the Russian setting; goodness knows we've seen New York and L.A. wiped out enough times already, so the change of venue is much appreciated. Finally, there's the cast, which includes Emile Hirsch and Olivia Thirlby. They're not usually the popcorn-movie sort. Sure, Emile has that whole unfortunate Speed Racer thing in his past, but he's been good enough in other movie's that I'll forgive him for that one. The Darkest Hour is set to hit theaters on Christmas Day, December 25th.